"Δ" redirects here. For the British indie rock group, see Alt-J. For other uses, see Delta (disambiguation). For other uses, see ∆. Delta (uppercase Δ, lowercase δ or 𝛿; Greek: δέλτα délta, [ˈðelta]) is the fourth letter of the Greek alphabet. In the system of Greek numerals it has a value of 4. It was derived from the Phoenician letter dalet 𐤃, Letters that come from delta include Latin D and Cyrillic Д. A river delta (originally, the Nile River delta) is so named because its shape approximates the triangular uppercase letter delta. Despite a popular legend, this use of the word delta was not coined by Herodotus. In Ancient Greek, delta represented a voiced dental plosive /d/. In Modern Greek, it represents a voiced dental fricative /ð/, like the "th" in "that" or "this". It is romanized as d or dh. The anonymous signature of James David Forbes. Determinacy (having a definite truth-value) in philosophical logic. 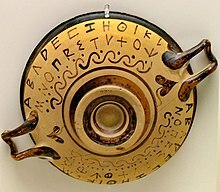 The alphabet on a black figure vessel, with a D-shaped delta. Text requiring deletion in proofreading; The usage is said to date back to classical times. In some of the manuscripts written by Dr. John Dee, the character of delta is used to represent Dee. Look up Δ or δ in Wiktionary, the free dictionary. ∂ - the partial derivative symbol, sometimes mistaken for a lowercase Greek letter Delta. ^ "Dictionary of Standard Modern greek". Centre for the Greek Language. ^ "Definition of DELTA". www.merriam-webster.com. Retrieved 26 October 2017. ^ Celoria, Francis (1966). "Delta as a geographical concept in Greek literature". Isis. 57 (3): 385–388. doi:10.1086/350146. JSTOR 228368. ^ Michael Comenetz (2002). Calculus: The Elements. World Scientific. pp. 73–74. ISBN 978-981-02-4904-5. ^ Dickenstein, Alicia; Emiris, Ioannis Z. (2005). Solving polynomial equations: foundations, algorithms, and applications. Springer. Example 2.5.6, p. 120. ISBN 978-3-540-24326-7. ^ Irving, Ronald S. (2004). Integers, polynomials, and rings. Springer-Verlag New York, Inc. Ch. 10.1, pp. 145. ISBN 978-0-387-40397-7. ^ Tepper, Pamela (2014). The Law of Contracts and the Uniform Commercial Code. Cengage Learning. p. 32. ISBN 978-1285448947. Retrieved 2018-04-30. ^ "Caduceus, the emblem of dentistry - American Dental Association - ADA.org". Retrieved 26 October 2017. ^ "Faculty - Economics Department". econ.duke.edu. Retrieved 26 October 2017. ^ MACHADO, Fábio Braz, NARDY, Antônio José Ranalli (2018). Mineralogia Óptica. São Paulo: Oficina de Textos. p. 85. ISBN 9788579752452. This page was last edited on 10 April 2019, at 14:58 (UTC).